I would like to order a new stylus. Where can I get one? Can I use a 78 RPM record with this turntable? The audio from my connected speakers is coming out distorted. How can I fix it? What do I do if I am hearing a hum through my speaker or laptop when using the turntable? My turntable won't spin when I move the tone arm over the record. What do I do? Is the turntable belt replaceable? My record is not playing at the correct speed; its pitch is too high or too low. Is the turntable powered by the USB port? My record is skipping. What should I do? Where can I get the latest version of the EZ Vinyl Tape Converter software? You can purchase a replacement stylus directly form the ION Audio website here. Otherwise, you can also contact the ION Audio Parts department directly by calling 1-401-658-3743 Ext. 1403. Absolutely! Be sure to obtain a 78 RPM stylus for use with your 78 RPM records, though. To obtain a 78 RPM stylus for your MAX LP turntable, you can purchase one directly from the ION Audio website here. Otherwise, contact the ION Audio Parts department directly by calling 1-401-658-3743 Ext. 1403. If you have connected speakers to the Compact LP using the RCA Audio Output connections, do NOT connect the RCA cables to a Phono input as this could damage your speakers. Ensure that you connect them to a line-level input such as AUX, CD, or TAPE. If you are recording to a laptop, please connect the laptop to a grounded power supply (3 prong). If you are playing through a speaker, ensure you are using the 12V DC 1A pin-positive power adapter that was included with your product. If your volume is on max, try turning it down until the hum stops. If you continue to experience difficulty, contact ION Audio technical support. Ensure the turntable is powered on (power switch in the back). Ensure AUTOSTOP is turned On and the tonearm is placed over record (if AUTOSTOP is Off it should always be spinning when power is on). If you continue to have further difficulties, contact ION Audio Technical Support for further assistance. Yes! For details on how to change or re-attach your turntable belt, see this guide here. First, ensure the 33 / 45 / 78 switch is set to the correct speed for your record. On the underside of Compact LP, find the rubber pad with the RPM speed you want to adjust, and gently lift up the rubber pad to remove it. For the 45 and 33 RPM setting, push through the rubber seal, and tighten/loosen the screw using a Phillips-head screwdriver to fine-tune the RPM speed. For the 78 RPM setting, tighten/loosen the screw using a flat-head screwdriver. No. The Compact LP is powered with the included 12V DC 1A pin-positive power supply. If the record is skipping, try cleaning the record directly using standard LP cleaning techniques. For some materials that can help with the cleaning of your vinyl, you can find the VINYL ALIVE Record Cleaning Kit on the ION Audio website. 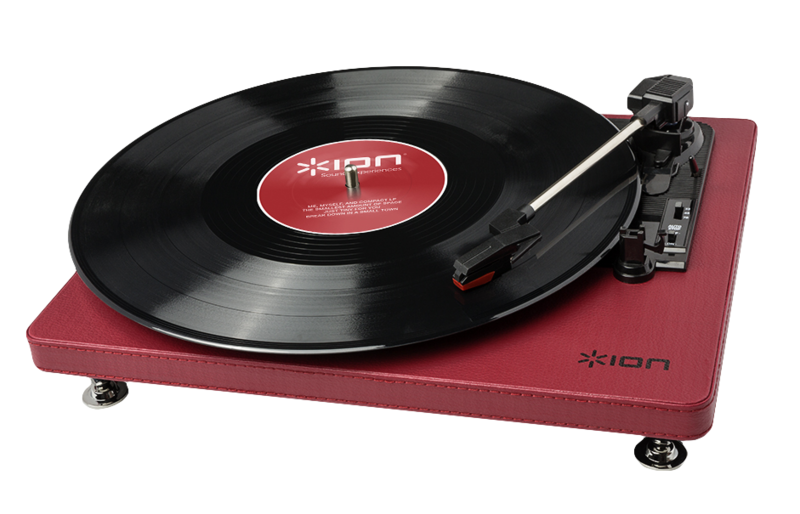 If the record continues to skip, consider replacing the stylus which can be purchased directly from ION Audio here. This is normal! The turntable mechanism base, platter & tonearm are engineered to float above the wood platform on isolation mountings to allow you to play music through the built-in speakers without feedback. You can download the latest version of the software here.